I identify as South African & British, of no faith but spiritual. I believe in Native American spirit medicine. I am heterosexual. My dad comes from South Africa and is Black mixed-race. On my dad’s side of the family we are mixed South African and African American. My mum is White and English and comes from Hampshire. When my dad came to England in the 70’s to escape the apartheid regime he met my mum in London. She knew one of his sisters. Mum and dad met in London and fell in love there. They moved to Cambridgeshire together and were both teachers. They have been married for 40 years and decided to move to Spain in 2003. I grew up in a tiny village near Ely in Cambridgeshire called Stretham. When I was 7 we moved to Portsmouth as mum and dad were both teachers and got new jobs in the area. My dad was getting bullied by the headmaster at the college he taught in because of his colour. I can remember racism was pretty bad from some people. On the day he resigned the staff played him Labi Sifri ‘something inside so strong’. Every time I hear it I think of dad and how strong he is. Mum and dad taught me from a young age that I am just me. They told me I was special and told me I was mixed-race. They said your John, but dad told me I would learn as I got older that some people might treat me badly cause of my colour. He said to not respect people that don’t respect me back and to turn the other cheek if I could. In junior school I got grief off some kids on the first day who were school bullies. A kid called James who later became my best friend got in the way with his friends. He told me that they had a problem with me because of my colour and he was really curious as to where I ‘came from’. He said, ‘I wish I was that colour’. I had never even seen myself as different from the other kids. I guess around that time I really began to recognise I was mixed-race. In 1989 I went to Canada and met my cousins for the first time. (Some of my dad’s three sisters’ kids) My older cousin Phil was into his hip-hop and his younger brother Neil was too as well as his basketball. Neil had hair like Will Smith in the Fresh Prince and I can remember thinking how cool my cousins were. I had started to get into hip-hop, but once Phil played me the Public Enemy ‘Fear of a black planet’ album as well as Ice T ‘Original Gangster’ I fell in love with the music and from that point I really started to get to know me. I really identified with my African roots and loved Black culture. When I was about 17 years old I got my hair braided. It used to be really long and comes out straight then curly at the ends (like Ice T’s hair back in the day!). Two good friends of mine at college came from Ghana and their mum spent hours braiding my hair for me! I really felt it made it clear who I was and showed I was proud of my identity. and when I went to college the next week with my hair in braids everyone crowded around me telling me how great it looked! My mum has always been very supportive of me identifying strongly with my Black side, as is my dad. Meeting my family in Canada who were mixed0race South African and African American really opened my eyes to who I was. My mum comes from a family who seem to have always been very opened minded about other people and cultures. I can remember my gran thought the world of my dad and loved me to pieces. My mum used to have Jamaican friends and even supported the Black Panthers! She is an internationalist and has been all round the world with her bestie. I think her families open mindedness was a godsend. I’ve experienced racism most of my life. Mostly in my teens and adult life but brushed off a lot at first. I’ve always been vehemently anti-racist but at points in my life have let so called ‘mates’ get away with slurs and clearly bigoted remarks about POC. It took me a while to start challenging people that discriminated against me because of my colour and my dad’s struggles have always been a real inspiration that good can triumph over evil and injustice. I’ve had micro aggressions to coming up against out and out racists. Despite not being an angel in the past I’ve experienced discrimination from the police because of my colour. I’ve never been a victim only a survivor and a fighter. When I went to South Africa in 2007 my eyes really opened. I totally get that White supremacy doesn’t allow for someone being ‘half’ of anything and sometimes it feels that if your mixed-race people put you in all-together different ‘other’ box than everyone else. In South Africa, racists don’t like mixed-race people. Sadly, that can echo elsewhere too. My social environment has always played a big part of my friend base. I’ve gone through the 90’s rave scene and met some real characters that became friends for life. 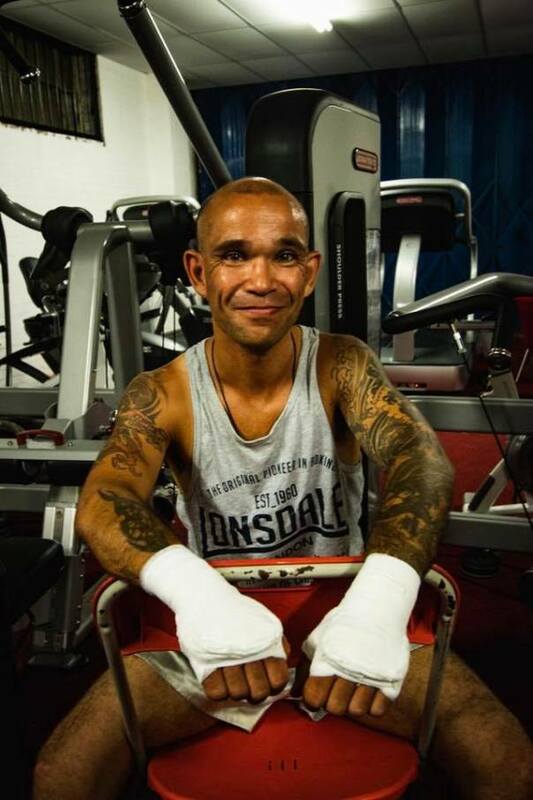 I’ve been Thai boxing for nearly 12 years and have met some amazing people from all walks of life and different backgrounds that have become friends, and all of my friends bar a couple have come from working class backgrounds. But that’s fine because it is the person that counts. I run my own business and occasionally meet people that make me think ‘I like you’. These days I am very much a socially aware and responsible person. I’ve never really had a problem fitting in but love my own company. I’ve never really done groups but have found myself having a big social circle and like having lots of mates and a few close friends. Being mixed-race always has had an effect on my personal life because I am very proud of who I am and where my roots are from. Being my own boss has given me a lot of freedom so if I encounter racism I am more inclined to speak my mind than say nothing and I can be quite out spoken at points about issues around race and class. I think that’s due to my own experiences over the years. Ultimately, any effects have only ever been positive. I learn by experience. Insults are never an injury and only add fuel to the fire. The nice stuff that often gets said to me has helped the shy kid grow into a confident man. Firstly, ignorant people (often quietly racist) can attack your identity by failing to acknowledge it. This is the micro-aggression thing, ‘why do you identify more with your Black side when your half White’ (as an example). This is White supremacy in action, it doesn’t allow entry for ‘half white’ but it does allow for a down play of someone who is mixed-race. Secondly, racist people find it easier to put you in whatever box applies to your demographic as long as you’re not like them. I think bias and stereotyping of us can occur in all walks of life but it’s fantastic to see attitudes are changing. Like James Baldwin said, ‘The world is not White’. My dad speaks Afrikaans like many mixed-race African people do but our roots come from the Khosan tribes. I would like to learn some African languages and have always felt that Afrikaans is the language of colonisers. When I went to South Africa years ago a security guard at the airport spoke to me in an African language assuming I would understand. My mum said to me ‘he must think you’re a brother’, and I felt a lot bigger inside. I connect most with my South-African/Black side. In terms of culture, well I guess I connect most with the music. I’ve listened to hip-hop for over 25 years now. The best hip-hop is social commentary. Prophets of the city from Cape Town were always pretty good as well. When asked where I’m from I firstly say ‘Portsmouth’, and then if they dig deeper I say I’m half South African. A positive for me is having a really big family with so many faces. Attitudes are changing towards people of dual heritage. I think identity politics has become more and more prominent over the past few years and although that’s not without its pitfalls it’s good to see people recognising who we are. Of course, the same challenges we’ve always faced still exist too, I guess in the end we are all the same, but we are all different too. I’d rather live in a society that is a melting pot of culture than anything else. If I had the opportunity to be reborn I’d want to come back as me because I love who I am, and I’ve always enjoyed the adventure.